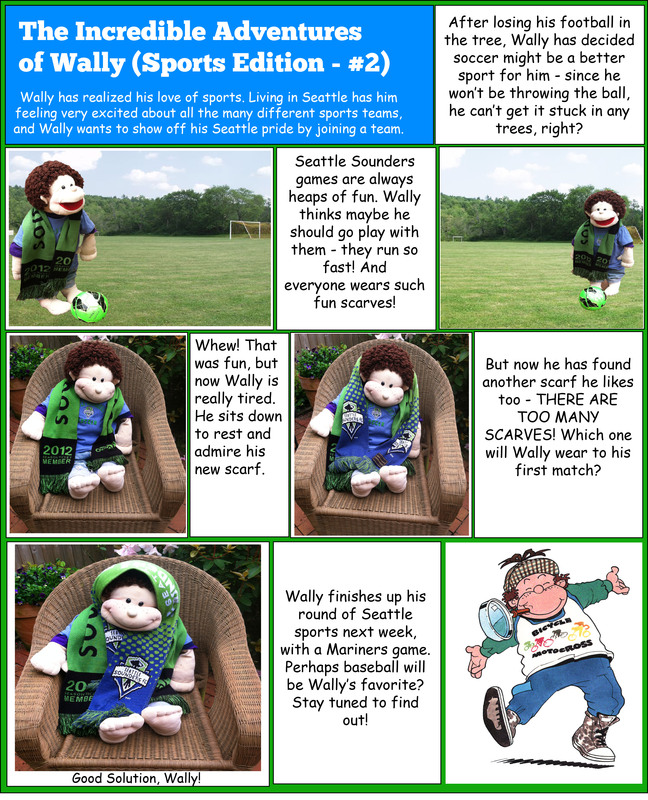 In our previous post, Wally helped us see how fun it can be to get outside, enjoy some sports, and play with friends and family! Well, Wally decided to take a break from Football after he lost his ball in the tree, and try his hand (or should we say “foot”??) at soccer instead! 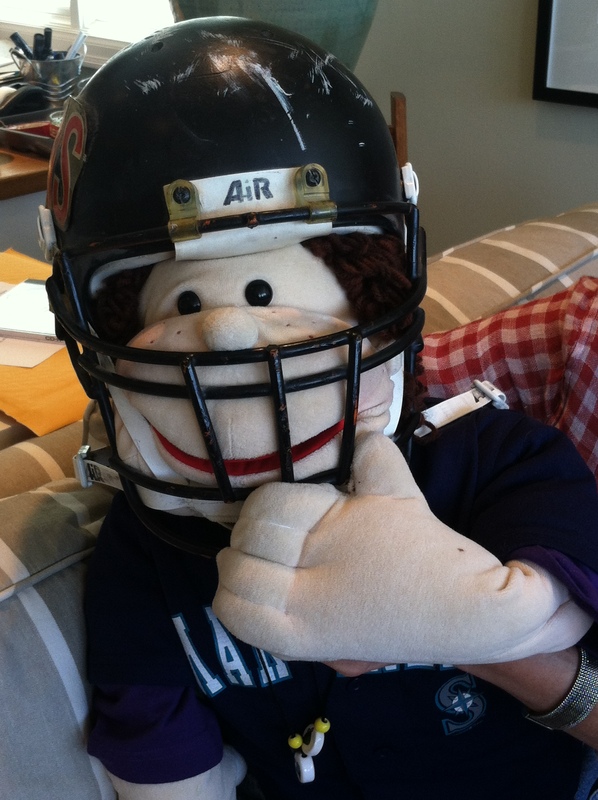 Besides, he didn’t like wearing a football helmet and his mother insisted he must if he were to play this game. Wally didn’t like wearing the heavy football helmet, but Carolyn insisted he must. 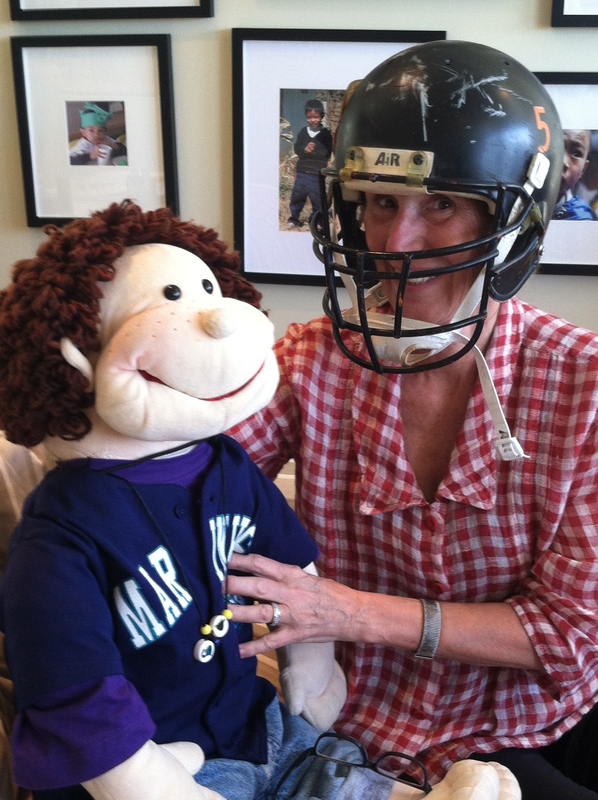 To prove her point, Carolyn put the helmet on also – to show Wally it’s not so bad. Then she realized Wally was right – it WAS really heavy! These two will have to stick to “non contact” sports, we think! Does it seem like Wally is flip flopping a bit? Should he give up on football so easily? Should he be bouncing around to different sports, or stick to one and become really proficient at it? Maybe that sounds like a silly question, but it’s one that many parents have asked themselves. Where is the line between promoting your child’s perseverance, commitment, and ability to follow the rules, and letting him make his own decision to give up because it is hard work or he doesn’t like the rules? Being child-directed, or child-led, is a really important way of letting your child explore his likes and dislikes. This allows your child to develop his or her own individuality and discover what activities are truly enjoyable. Of course, it’s good to promote perseverance – if something is difficult, that doesn’t mean it can’t also be fun. Striking the balance between encouraging your child to be persistent while still allowing them the freedom to explore options and do something else is key! Through exploration and play, children will learn which activities are right for them. It might be a team sport such as soccer, football, golf, swimming, softball, rugby or basketball, or a more individual sport such as running, walking, gymnastics, learning to yoyo or joining the circus! (It happens!) The take away point should always be focused on physical and mental health and, particularly for children, having fun and spending time together as a family and with friends. 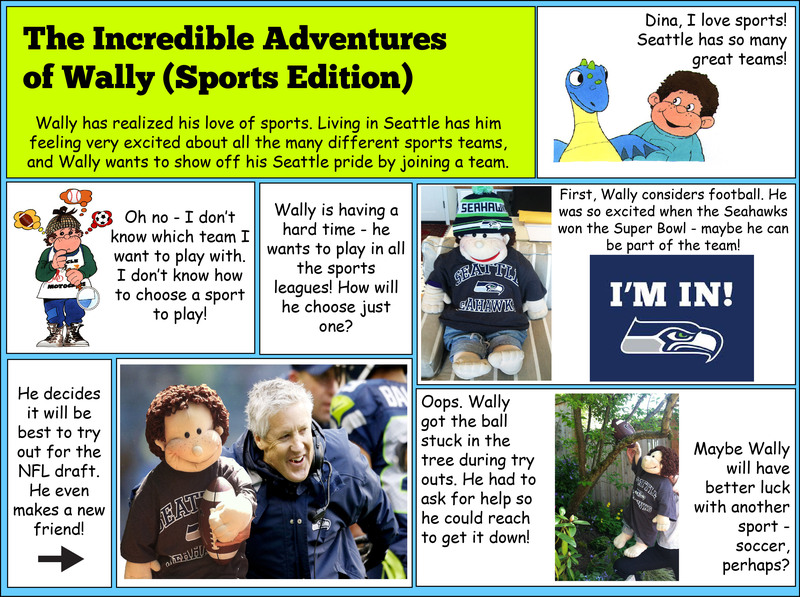 Categories: Exercise Series, Incredible Years, Just for fun | Tags: child health, healthy activity, Incredible Years, parenting, puppet play, Seattle, seattle sounders, Sports, sports edition, young children | Permalink.